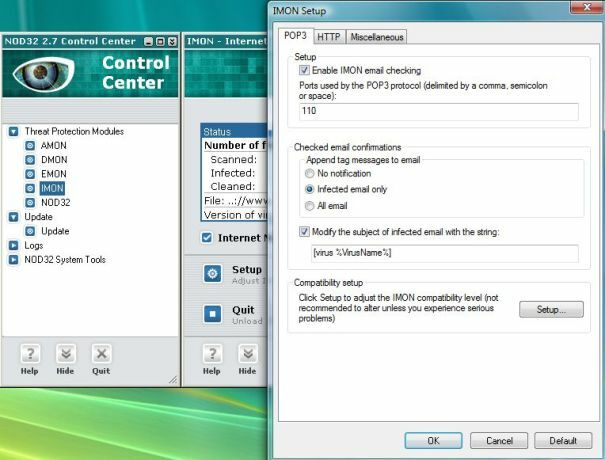 When install and run NOD32 anti virus program from ESET with default configuration, NOD32 will append a tag message to the footer or end of all the POP3 email which has been downloaded from mail server to the local computer email client such as Microsoft Outlook, Outlook Express, Mozilla ThunderBird, Eudora and etc, and checked by NOD32 IMON (Internet Monitor) when passing through port 110, or by EMON (Microsoft Outlook Email Monitor) when going to Outlook Inbox. The message looks like the following. This default behavior of appending virus checking confirmation message to the email can be disabled, or set NOD32 to include the message only on infect email. The following tutorial guide will show you how to do turn off the message appending to email. On the IMON – Internet Monitor right pane, click on Setup button. On POP3 pane and Append tag messages to email sub-section of Check email confirmations section, select the radio button of the option prefer. Three options available which are no notification, infected email only and all email (default).